NEW SHARON — Young readers at Cape Cod Hill School welcomed a wonderfully unique – and unusually furry – guest recently. 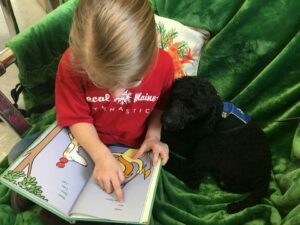 Jasper, a therapy and emotional support dog, owned by Principal Lisa Sinclair visited the school to listen to first-grade students read out loud. Jasper is one of four emotional support dogs owned by Sinclair. Julie, Jenny, Josie and Jasper are bred for their temperament and trainability to be lifelong emotional support partners.